Accountability is the new black for marketers. According to a survey taken by the Association of National Advertisers (ANA) of 1,000 marketing executives, 66% ranked the accountability of marketing as their number-one concern. A similar study by the CMO Council revealed that 80% of respondents were “dissatisfied” with their ability to measure ROI. While the desire of marketers to demonstrate that they are allocating marketing investments as efficiently as possible is admirable, they are doing themselves a disservice with their current obsession with ROI. By interpreting marketing accountability solely in terms of a metric of short-term payback, marketers are reinforcing the impression of marketing as a merely tactical discipline. The bigger question — and the one that will earn marketers a seat at the boardroom table in a way that no amount of ROI measurement can — is whether brands truly are assets that enable the business to generate superior returns over time. The first point for marketers to recognize is that, to qualify as an “asset” in financial terms, a brand needs to be measured in terms of its ability to generate future cash flow. The second point is even more important: Value can only be created by changes in customer behavior. Changes in customer attitudes are nice, but in and of themselves they do not generate cash flow. This means that many of the traditional metrics favored by marketers — awareness, familiarity, and quality — are no longer suitable as measures of brand equity. They still do a good job of measuring the scale of a brand’s market presence and the likelihood that the brand will make it into a given customer’s consideration set. However, they do a poor job of explaining the final purchase decision, and therefore do not provide a reliable measure of the brand’s ability to generate cash flow. So the third point is that brand equity needs to be measured in a way that captures the source and scale of this emotional augmentation that the brand provides to the underlying functionality of the product or service. Only such a definition of brand equity will identify the extent of the customer utility that the brand has created. The second type of approach measures equity in terms of the scale and nature of the utility that the brand delivers to customers. One of the best known examples of the “outcome” type of approach is the work of Fred Reichheld, the author of The Loyalty Effect (1996) and Loyalty Rules (2001). His premise is disarmingly simple — “willingness to recommend to a friend” is the single most reliable measure of brand equity. Specifically, your “net promoter” score (the number of people willing to recommend your brand minus those who are not willing to do so) provides an accurate predictor of your company’s growth prospects. In similar vein are approaches that stress “willingness to pay a price premium” as the truest test of the existence of brand equity. And the advantage of these approaches is that they provide a direct input into a valuation model like the “revenue premium” methodology advocated by Professor Don Lehmann of Columbia University. The limitation of “outcome” approaches is that, while they may accurately quantify how much brand equity you enjoy, they provide limited insight into what creates this equity. The second type of approach tries to quantify the extent of brand equity that a brand enjoys by measuring the degree of “relevant differentiation” provided (although most do not explicitly use this term). 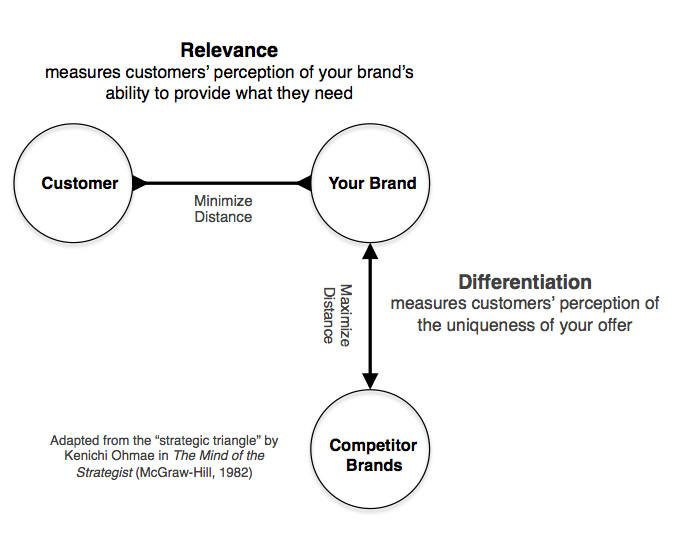 “Relevant differentiation” is an important metric because it measures the success of marketing in terms of the extent to which two goals have been achieved — maximization of the perceived fit between your brand and your customer’s needs; and maximization of the perceived differentiation of your brand versus its competitors. A high relevant differentiation score provides insight into why a certain brand is perceived to be uniquely capable of meeting customer needs. Following are profiles of a number of well-established brand equity models that seek to identify the scale and sources of brand equity. 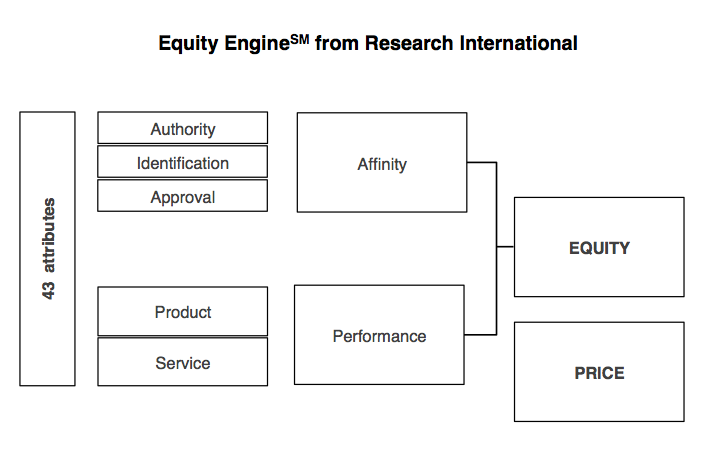 Equity EngineSM, developed by Research International, is one of the most elegantly parsimonious models of brand equity. Essentially, it expresses brand equity as a combination of the functional benefits delivered by the brand (performance) and the emotional benefits (affinity). Underlying each of these macro constructs is a further layer of analysis that expresses performance as a function of product and service attributes, and affinity as a function of the brand identification (the closeness customers feel to the brand), approval (the status the brand enjoys among a wider social context of family, friends, and colleagues), and authority (the reputation of the brand). Equity EngineSM incorporates a form of conjoint methodology that establishes the price premium that a brand’s equity will support while still maintaining a “good value for money” rating from customers. 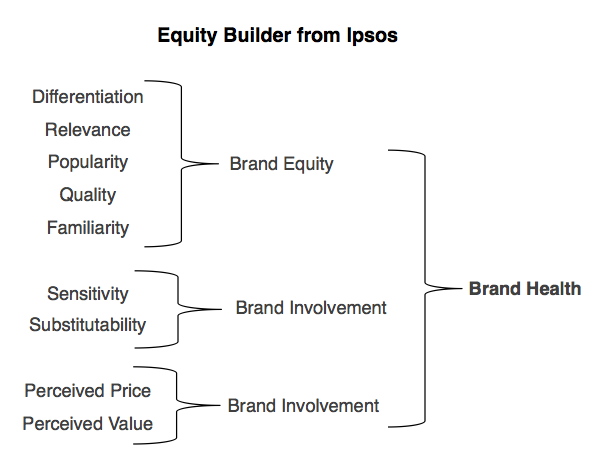 Equity*Builder, the methodology developed by the Ipsos Group, is more uniquely focused on establishing the emotional component of brand equity. Importantly, it situates a brand’s attitudinal equity (measured in terms of differentiation, relevance, popularity, quality, and familiarity) in the context of the degree of customer involvement with the category in question. Similar to Equity EngineSM, Equity*Builder also explicitly addresses how brand equity translates into perceived value and price. 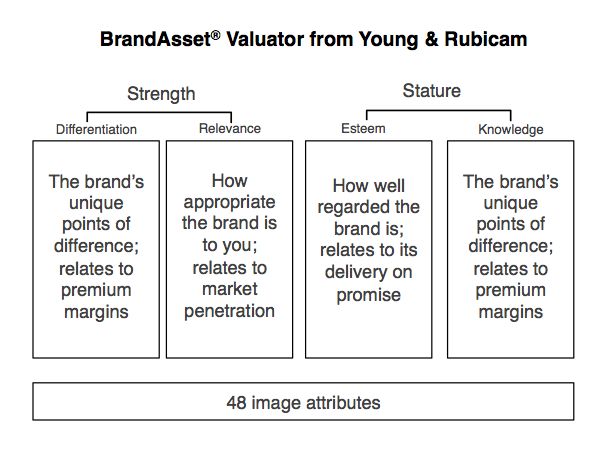 The BrandAsset® Valuator, developed by Young & Rubicam, is noteworthy in that it eschews the category-specific approach taken by other brand equity methodologies and seeks to establish a pure measure of brand equity independent of category context. All 2,500 brands in its U.S. survey are rated on the same 48 attributes and four macro constructs of differentiation, relevance, esteem, and knowledge (curiously similar to the Ipsos approach, which it pre-dates). The constructs of differentiation and relevance are then combined into a single metric of brand strength that, through Young & Rubicam’s collaboration with the financial consultancy Stern Stewart, has been shown to provide a powerful explanation of superior market value. The constructs of esteem and relevance are combined to form brand stature that, interestingly, is correlated to current market share but not potential for growth. 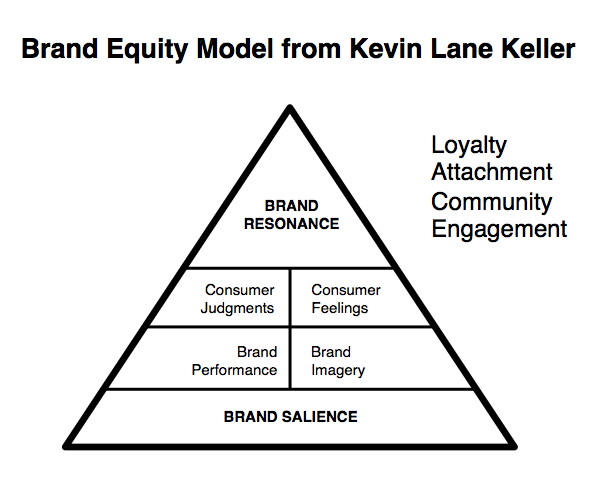 Although not available as a commercial methodology, Kevin Lane Keller‘s brand equity model is worthy of mention because of his authority within the brand equity measurement arena (he is professor of marketing at the Tuck School of Business at Dartmouth and recently co-authored the 15th edition of Marketing Measurement with Philip Kotler). Kevin Lane Keller mirrors the Equity EngineSM approach by seeing the brand as a blend of the rational and the emotional, measured in terms of performance characteristics and imagery. Customers’ relationship to a brand can be plotted in terms of their altitude on the pyramid of engagement and their relative bias towards a rationally dominant or emotionally dominant relationship. 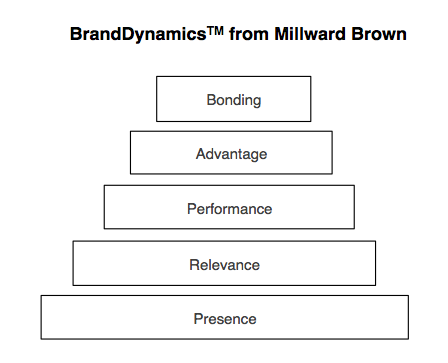 The notion of a pyramid of engagement is echoed in the BrandDynamicsTM methodology developed by Millward Brown. This approach characterizes the relationship that a customer has with a brand into one of five stages: presence, relevance, performance, advantage, and bonding. “Presence” customers have only a basic awareness of the brand while “bonded” customers are intensely loyal, at least in their attitudes. The underlying premise is that the lifetime value of customers increases the higher up they are in the pyramid. All of the aforementioned approaches suffer from the fact that they are attitudinal in nature and have yet to establish the definitive relationship between measures of attitudinal engagement/loyalty and observed behavior. 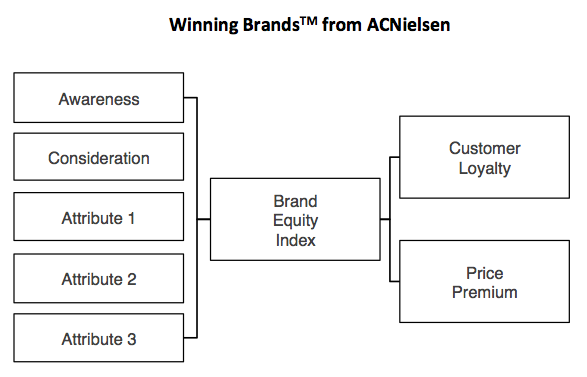 Winning BrandsTM is the methodology developed by ACNielsen. In contrast to the attitudinal approach to brand equity measurement embodied in the other approaches described, Winning Brands begins from a behavioral observation of brand equity. Brand equity is measured in terms of a customer’s frequency of purchase and the price premium paid. Once favorable behavior is observed, the methodology seeks to analyze the attitudinal characteristics of those customers.